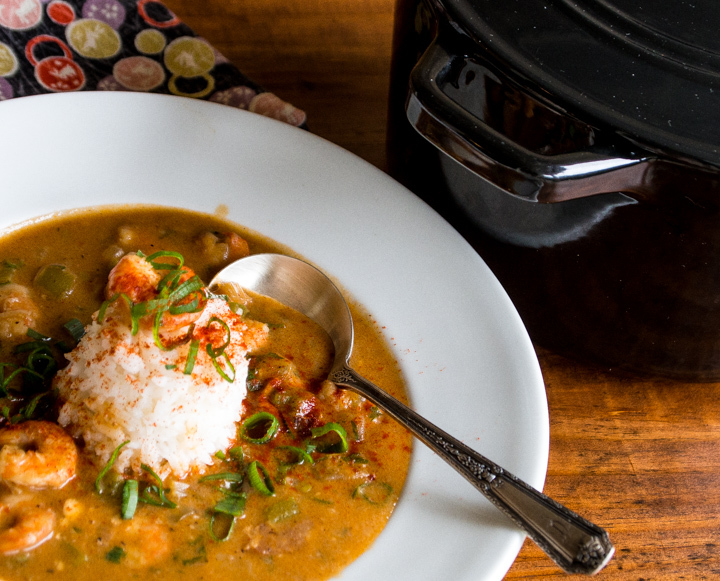 Two things separate this version of shrimp étouffée from most of the others. 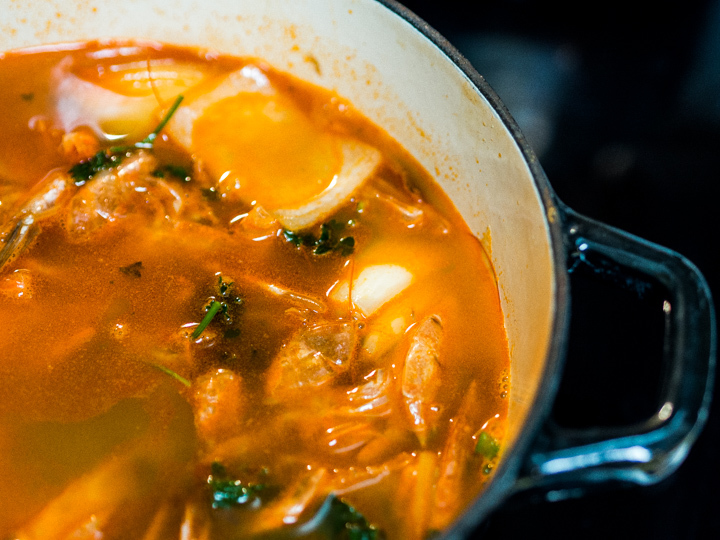 A rich shrimp stock and smoked bacon fat in the roux. Without these it will be good but not “I’ve eaten this now I can die” good. For years I made my shrimp and crawfish étouffées with a vegetable oil roux and water for the broth, and for years I wondered why it stubbornly remained mediocre. It wasn’t bad enough to completely rethink but it lacked pizzazz. “With heads of course.” I answered. “Right,” she said. “In a pan with no water. Don’t you brown your bones before you make soup? Well, it’s the same thing here. Develop the flavor by cooking them in a little olive oil then throw in the other fixins, and then add the water. Believe me you’ll taste the difference.” And I did. The second variation was to replace the vegetable oil with butter and to spike the butter with bacon fat. The rest of the recipe is pretty standard and easy. It doubles and triples up for crowds and if you have shrimp stock premade it’s very fast. Which brings me to the topic of making stock ahead of time. Unfortunately, there is no decent commercial shrimp stock. If you want to whip up gumbo, étouffée, shrimp stew or a host of other such dishes at the last minute you need stock. And ultimately, the easiest way to have it is to make it in bulk and freeze it. When you stumble on fresh head-on shrimp buy a lot, make a lot, and freeze it in one or two cup amounts. That way you will always be prepared. It beats water by a mile. See those little flecks of orange fat in the shot below? See the pot of bright orange stock? That’s head fat! All that screaming highway cone orange color came from those little flecks in the heads. Nuff said. As for the shrimp you can use any kind but I prefer the small ones. You’ll probably be eating this with a spoon so bite size is best and don’t let anyone tell you otherwise. Every time I buy small shrimp I’m reminded of my friend Elizabeth who attempted to explain to a recalcitrant fish counter attendant at Balducci’s in Greenwich Village the importance of matching the size of the shrimp to the recipe. He didn’t know what gumbo was, he wasn’t sure if they had any small shrimps but he was sure he didn’t want to check. His final response, “Whazza matta? You don’t got enough money fa jumbo?” At that point she gave up. She got the jumbo and chopped it into smaller pieces which is what I do when I can’t find the small size. So here it is. I know the recipe looks menacingly long but take my word for it. It’s easy. Most of the ingredients are only condiments so if you’ve made the stock ahead of time it’s almost like fast food. Add a couple of tablespoons of olive oil to the pan. Add the heads and shells and stir over medium heat until pink, about 10 minutes. They should give off a noticeable aroma. This develops flavor. Add water, veg, bay leaf, garlic, and cloves. Dice bacon and fry over a low heat until brown then remove. Stir the butter into the bacon fat until melted. Whisk in the flour and keep stirring until you get a medium brown roux about the color of a football. Next add the shrimp stock and cook for about 10 minutes. Now add the shrimp, black & cayenne peppers, lemon juice, bay leaf, & parsley. Let it simmer on a very low heat for about 10 minutes. At this point check the thickness of the gravy and add hot water as desired. You may make this with any size shrimp. I prefer medium to small because it's in a broth or gravy and you eat it with a spoon. 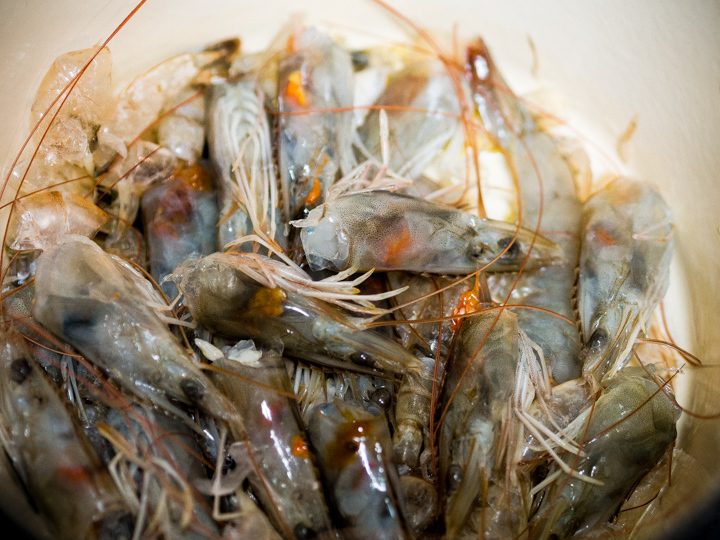 If you're using large or jumbo shrimp you can cut them into smaller chunks. For crawfish etouffee just substitute crawfish for the shrimp. If you have crawfish stock great. If not shrimp stock is fine.